Cayden Long, age 7, suffers from cerebral palsy, but his older brother Conner, age 9, doesn’t let that stop them from playing sports together. They participated in their first triathlon as “Team Long Brothers” on June 5th, 2011 and over the last 18 months have competed in 14 races. Conner tows Cayden in a raft while swimming, pulls him in a trailer for cycling and pushes the trailer during the run. Ten years from now the perfect place for me and Cayden would be… [to] have the Team Long Brothers flag on the moon. 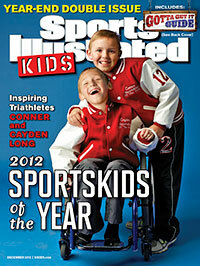 The brothers were honored as 2012 SportsKids of the Year at a star-studded event in New York as part of the Sports Illustrated Sportsman of the Year ceremony.